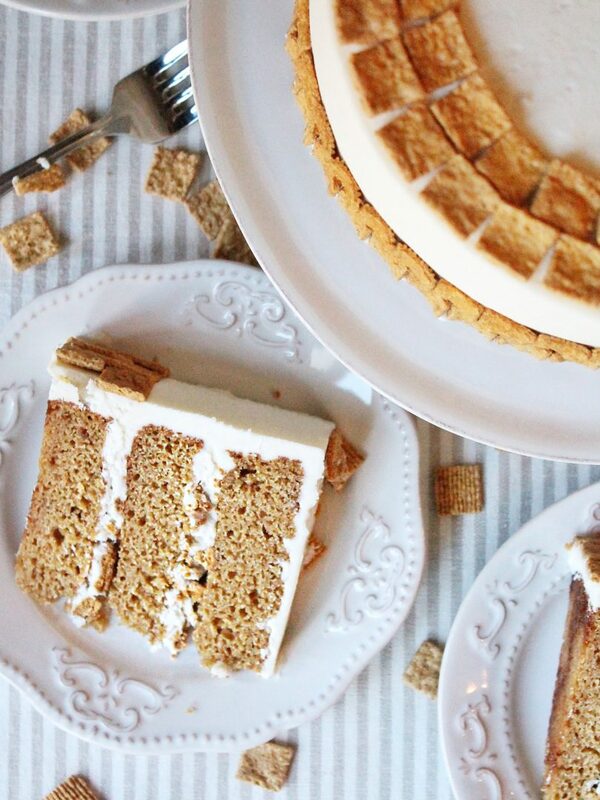 Taking things back to my childhood yet again with another cereal-inspired cake. My new Golden Grahams Cake is filled with layers of Golden Grahams cake layers, Golden Grahams crunch filling, and a “milk” vanilla buttercream. As you probably know by now, my love of cereal runs deep. Don’t tell cake this, but cereal is actually my favorite food. (But cake is a close second!) I love it in the morning, afternoon, and evening. In fact, sitting down with my kids with bowls of cereal in front of us has become a nightly ritual at our house. We call it our “second dinner.” But for me, that time is about more than just another “meal” together. It’s a time my kids start to talk about things that never came up during the day. They seem to have so much to say during “second dinner.” Sometimes it’s fun facts they learned that day, sometimes it’s jokes, sometimes it’s problems that happened at school, and sometimes it’s just stuff they want to get off their chest. No matter what they’re talking about, I just listen. It’s easily my favorite part of the day! And, of course, I simply love how cereal tastes. I usually go for flavors like Life, Cheerios or Special K with Strawberries. But, I’ll also never turn down a bowl of Lucky Charms, Golden Grahams or Cinnamon Toast Crunch! I truly love it all! 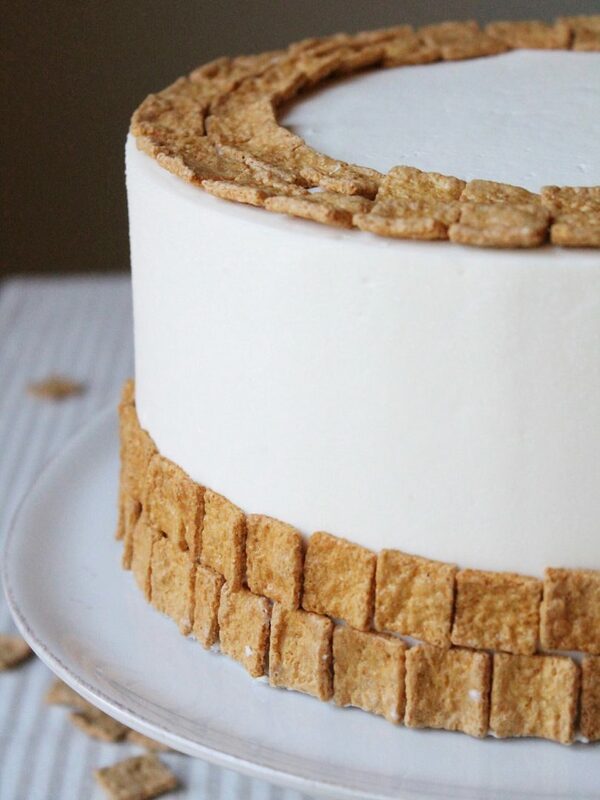 The idea for my first cereal-inspired cake came from Christina Tosi of Milk Bar. As I was flipping through her cookbook one day, I noticed recipes for her Cereal Milk and Cereal Crunch. She uses them in her ice creams, cakes, and cookies. It’s a truly brilliant way to add the flavor of cereal to any kind of dessert. I ended up trying both recipes with Fruity Pebbles for my Fruity Pebbles Cake I did last year. 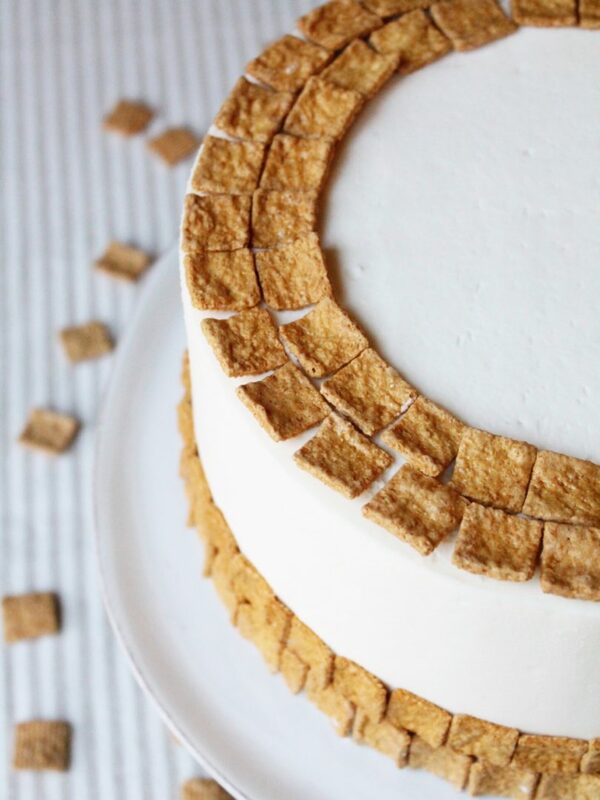 It was such a hit that I’ve been dying to do another cereal-inspired cake ever since. I recently reposted my Fruity Pebbles Cake on Instagram and asked you what flavor of cereal cake they’d like to see next. 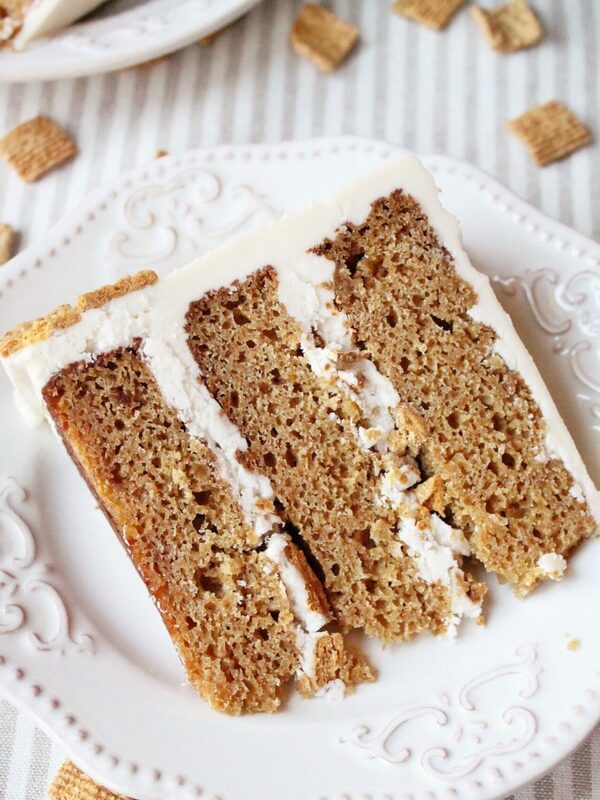 Cinnamon Toast Crunch was super popular, but I decided against that one because I already have a Churro Cake and Snickerdoodle Cake: both of which have similar flavors to Cinnamon Toast Crunch. So, I looked at the next most requested cereal and it happened to be another one of my favorite cereals – Golden Grahams. After I decided which cereal flavor to make as my cake, I used the base recipes from Milk Bar for the Cereal Milk and Cereal Crunch. For the Cereal Milk, all you have to do is let the cereal soak in milk for about 20 to 30 minutes. You’ll then strain and save the milk for the cake. For the Cereal Crunch, you’ll simply combine the cereal with milk powder, a little sugar, salt and melted butter. It then bakes for a bit to cook all the pieces to help give the cake an extra crunch. I do recommend doing the assembly of this cake as close as possible to the time you plan to serve it. The Cereal Crunch does tend to get soft if you do it too far in advance, even if you freeze it. I usually make each component of the cake ahead of time and then assemble day of my party or event. Everything stores well in the freezer in airtight containers. But just for good measure, the recipe for the Cereal Crunch gives you plenty to fill the cake and to serve some with each slice. The texture of this cake reminds me a lot of my Biscoff Cake. You’ll notice it’s a little more dense than a typical yellow or chocolate cake. The “milk” vanilla buttercream is so light and fluffy, it provides the perfect balance to the cake layers. I have assembly instructions in the recipe, but here’s a quick assembly video to help you along too! Golden Graham cake layers with a Golden Grahams cereal crunch filling and "milk" vanilla buttercream. Preheat your oven to 350 degrees F. Spray your 6-inch or 8-inch pans with non-stick cooking spray, line the bottoms with parchment and spray again. Set aside. Place the Golden Grahams cereal in a food processor or blender and pulse until the cereal is finely ground and resemble flour. In a medium-size bowl, combine the cereal crumbs, all-purpose flour, baking powder, baking soda, and salt. Whisk until the ingredients are well-blended. In the bowl of a stand mixer fitted the paddle attachment, beat the butter and sugars on medium speed until light and fluffy. Add the eggs, one at a time, beating well after each addition. With the mixer on low speed, add 1/3 of the dry ingredients and mix until combined. Slowly add half of the cereal milk and mix until incorporated. Continue alternating the flour and cereal milk until it has all been incorporated. Scrape down the sides of the bowl and slowly mix for another 20-30 seconds. Divide the batter evenly among your pans and bake for 20 to 25 mintues. Cool 10 minutes on a wire rack before inverting onto cooling racks to cool completely. Combine the milk and cereal in a medium bowl. Let sit for about 20 minutes at room temperature. Strain the milk through a fine mesh sieve or strainer, collecting the milk in a small bowl. Collect 2 cups. Pour the Golden Grahams into a medium bowl and crush them a little with your hands. Add the milk powder, sugar, salt, and toss to mix. Add the melted butter and toss to coat. As you toss, the butter will act as glue, binding the dry ingredients to the cereal and creating clusters. Spread the clusters on a parchment lined sheet pan and bake for 20 to 25 minutes. Cool completely before using or store in an air-tight container in the freezer for up to a month. In the bowl of an electric mixer fitted with the paddle attachment, add the butter and beat on medium speed for 2 minutes, until nice and fluffy. With the mixer on low speed, gradually add the powdered sugar. Mix until combined. Add the cream, salt and clear vanilla. Turn the mixer to medium-high and beat for 5 minutes. With the remaining frosting, beat by hand with a wooden spoon to push out any air pockets before frosting the cake. Place your cake board on a turntable. Spread a small dollop of frosting on the cake board and place the first cake layer, top side up, on the center of the cake board. Carefully spread about 3/4 to 1 cup of the frosting on the cake layer, followed by about 1 cup of the Golden Grahams Crunch. Place the second cake layer, top side up, on the fillings and repeat step 2. Place the final cake layer, top side down, on the second layer of fillings. Lightly frost the cake to create a crumb coat. (This layer of frosting is meant to be thin and does not need to be perfect. The point of the crumb coat is simply to lock in the crumbs.) Freeze the cake for 10 to 15 minutes to set the crumb coat. Continue frosting the cake with the remaining frosting and extra cereal. 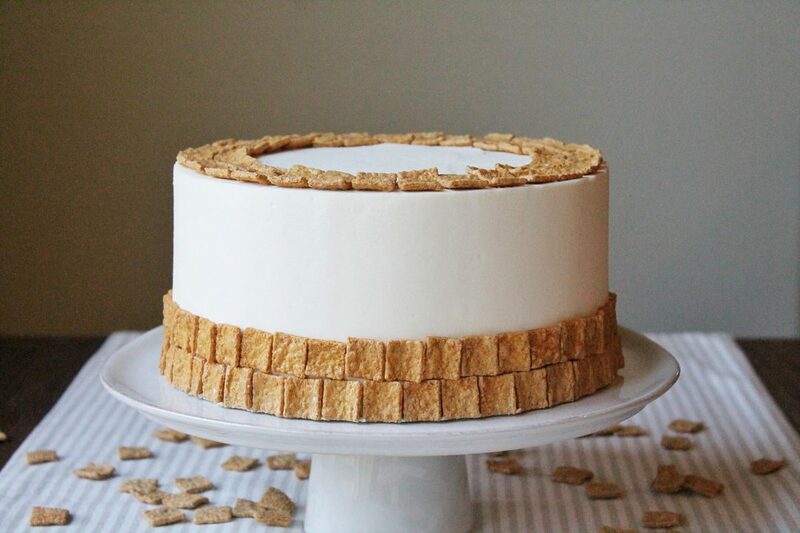 I like to save the extra cereal crunch to serve with each slice of cake. This cake is best served shortly after assembly. You can make each component ahead of time, but I recommend doing assembly close to the time you plan to serve to make sure the cereal crunch still has a crunch. Does the cereal get soggy in between the layers? If you make it too far in advance it will. I recommend assembling the cake day of event.